There have been many films made about the fascinating Tudors and they range from the sublime to the truly awful, rather like the many biographies which fill bookstores and bore readers. The films are listed in chronological order and this list is not definitive. There have been numerous adaptations of the classic Mark Twain novel which begins during the final days of Henry VIII’s reign. This link will take you to the most recent version. This film stars the great Charles Laughton as King Henry and beautiful Merle Oberon as Anne Boleyn. It’s the first ‘Tudor movie’ I ever watched and still one of the best. It can be purchased on video. Interesting note – Laughlin’s real-life wife, Elsa Lanchester, plays Anne of Cleves. The two later co-starred in Billy Wilder’s superb adaptation of Agatha Christie’s ‘Witness for the Prosecution’, – check it out, it’s a fun, suspenseful film with a different twist ending from the book. This film is based upon a Maxwell Anderson play, and stars Katharine Hepburn as Mary Stuart and the great Fredric March as Bothwell. It was directed by John Ford. It can’t be purchased; check the cable listings. Vivien Leigh and Laurence Olivier play lovers against the backdrop of Anglo-Spanish intrigue, with Flora Robson as Queen Elizabeth I. This is a nice, swashbuckling romance with intrigue and intelligent dialogue. This film is based upon the Maxwell Anderson play, as was Anne of the Thousand Days (below) and Mary of Scotland (above). It has an interesting cast – Bette Davis in her first incarnation as Queen Elizabeth, the great Errol Flynn as Essex, and Vincent Price (before he was typecast in horror films) as Walter Raleigh. It can’t be purchased; check the cable listings. Based upon the Margaret Irwin novel, which has recently been reissued, this film stars Jean Simmons as Elizabeth Tudor. Charles Laughton reprises his role as Henry VIII from The Private Life of Henry VIII (above). The plot is primarily concerned with Elizabeth’s relationship with Thomas Seymour, and takes great historical liberties; it is entertaining and well done. It can be purchased on video. And read Irwin’s work, too – she’s incredible. This film tells the story of Henry VIII’s youngest sister Mary and her forbidden love affair with Charles Brandon. I haven’t seen it but several visitors have told me it’s wonderful; you can purchase it on VHS. Once again, Bette Davis plays Queen Elizabeth; Richard Todd plays Raleigh and Joan Collins is his true love. I recently watched it again on AMC; it’s colorized and the men wear a lot of wacky-colored clothes (which is actually realistic, though jarring.) The dialogue is witty and Bette Davis is always fun to watch. It can be purchased on video; also, check the cable listings. This film is based on Robert Bolt’s play and stars Paul Scofield as Sir Thomas More, executed for refusing to recognize Henry VIII as head of the English church. This is a great film worth watching on its own merits, even without its Tudor connections. The story of More’s refusal to betray his conscience is justly famous and the film is a wonderful tribute to his life and accomplishments. It is available on dvd. Look out for the uncredited cameo of Vanessa Redgrave as Anne Boleyn. This film stars Genevieve Bujold as Anne Boleyn and Richard Burton as Henry VIII. It’s entertaining, the supporting actors are good, and Bujold’s performance has grown on me; she shows the vulnerability beneath Anne’s wit and charm. It’s based upon Maxwell Anderson’s play. If they remade this film, wouldn’t Virginie Ledoyen be the perfect Anne? This is a great Masterpiece Theatre series which was shown on PBS in America. It stars Keith Michell as Henry VIII and is divided into six parts, one for each wife. It was recently released on dvd. I have written a review of the dvd at Amazon.com; click here to read it. Michell later appeared in a film version of the series, much shortened, of course, and with different actresses portraying the wives. I should admit that I am a fan of Vanessa Redgrave and thus suitably biased, but this is an entertaining movie. It also features the equally great Glenda Jackson as Queen Elizabeth, a role she reprised in the Masterpiece Theatre series, Elizabeth R. Redgrave was nominated for the Best Actress Oscar for her role. In the film there is a meeting between the two queenly cousins, – the meeting never occurred in real life, though Mary desperately wished for it. This Masterpiece Theatre mini-series starring Glenda Jackson as Elizabeth is fantastic. And it was recently released on dvd, with lots of extras. I have written a review of the dvd at Amazon.com; click here to read it. It’s worth the expense. Jackson is incomparable and the series itself is wonderful. The mini-series format gives the story enough time to unfold and what a fascinating, engrossing story it is – the great events of Elizabeth’s reign, the facets of her character, her interminable marriage negotiations….. these are treated in detail and with commendable historical accuracy. The supporting actors – Mary, queen of Scots, Dudley, Cecil (William and Robert), Bacon, Essex, etc – are also superb. This popular film stars Helena Bonham Carter as Lady Jane Grey and the very handsome Cary Elwes as Guilford Dudley. 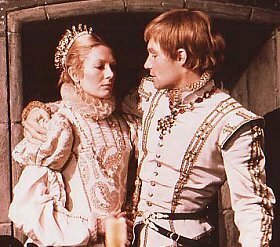 The movie, like many Tudor flicks, is less than accurate in the facts department, mostly concerning Jane and Guilford’s marriage. But the invented ‘love story’ between them is well done and saves the film from being too depressing. I had the pleasure of seeing Jane Lapotaire, who plays Princess Mary in this film, portray Katharine of Aragon at a RSC production of ‘Henry VIII’. Lady Jane is finally available on dvd. This film stars Gwyneth Paltrow as the fictional Lady Viola de Lesseps and Joseph Fiennes as Shakespeare. Judi Dench appears briefly as Queen Elizabeth I; though her time on screen is short, she is unforgettable. There are numerous supporting actors who also shine. The costumes, sets, and musical score are also wonderful. Paltrow and Fiennes are lovely together; the script is witty and fun; and the ending is spectacular. This is one of the few films I’ve seen that successfully mixes genres. And it’s almost as if the actors themselves knew they were in a great film. Their performances are confident and enthusiastic. This is truly a joy to watch. I went to see this film on a whim and then promptly forced family and friends to watch it with me. Some naysayers have written to me in disagreement and all of their complaints are directed against Paltrow. I think she is perfect in the role; even her scenes as the cross-dressing Thomas Kent are great. But opinions can differ – and even if you dislike her performance, there is much else to recommend the film. Both Shakespeare in Love and Elizabeth were released around the same time in 1998. Ironically, as it turned out, I was really looking forward to Elizabeth and didn’t give SIL a thought. There are numerous Shakespeare in Love fan sites; visit their webring. This film stars Cate Blanchett as the Virgin Queen. I disliked this film when I first saw it, though I admired the visuals. The cinematography and costuming were excellent; some of the acting was impressive, particularly Blanchett and Christopher Eccleston as Norfolk. (When are they ever bad?) But I found the story and direction to be muddled and overwrought, as was the score. I recently watched it again. And again, I admired Blanchett’s performance and the costumes were still spectacular. But I still wonder why they felt the need to rewrite one of the most compelling female lives of all time. And did Elizabeth live in a cathedral?!? This film is an adaptation of Philippa Gregory’s popular novel. It was produced by the BBC and stars Natasha McElhone as Mary Boleyn and Jodhi May as Anne. The film premiered in the UK in spring 2003. As of October ’03, it hasn’t aired in the US and isn’t currently scheduled for sale anywhere. I love this French film starring the incomparable Isabelle Adjani as Marguerite, daughter of Catherine d’Medici and princess of France. It’s a wonderful story with great historical accuracy. And can you believe Adjani was 38 when she made this film? Let’s hope it will be released on dvd in the US soon. Until then, read the Alexandre Dumas novel upon which it’s based. I think it’s one of his more entertaining works. This film is a retelling of the Cinderella story set in 16th century France. Drew Barrymore plays the heroine who triumphs over the ugly stepsisters and evil stepmother. It’s very entertaining; the performances are fun, the costumes beautiful, and the romance endearing. The official movie site is still up; click here to visit.